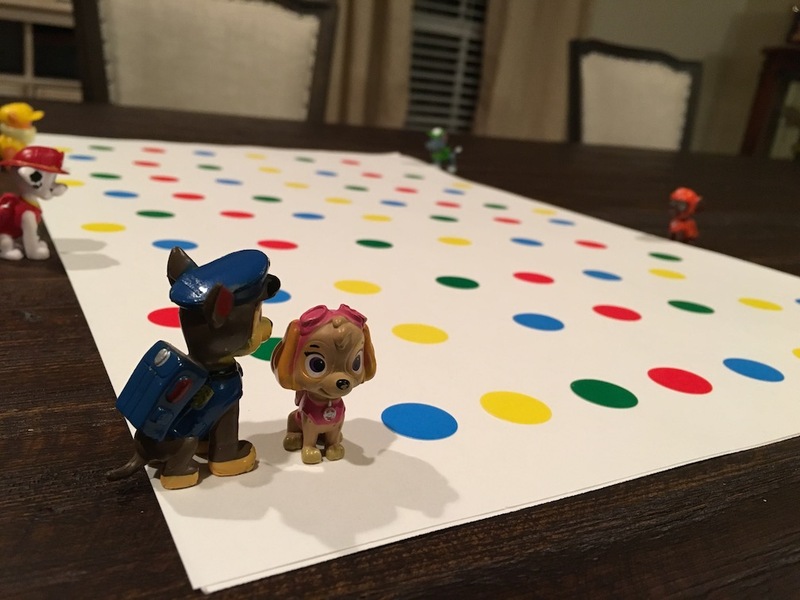 I made a Paw Patrol-themed board game for my daughter. It uses both physical and digital components. I wanted to create a game that would bring her delight without bringing me suffering (like so many board games for young children). It didn't end up being a great game but it was enough fun to build and play with Kate that I suggest you try making your own. 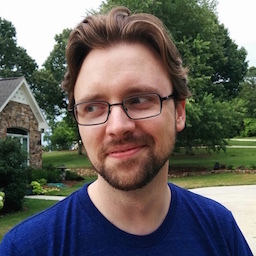 I'll talk about the background, the design/implementation, and what worked and didn't work. I'll also use the word "pup" more times than anyone is comfortable with. My daughter, Kate, is 4 and a half and we describe her as "spirited." When I finish work for the day, she's my other boss. She has a huge imagination and we have a lot of fun together. One board game we play together is Candy Land. The beauty of the game is in its simplicity: You race to the end of the board by drawing cards and moving to next colored space. If you get a double color, you move twice. Simple to learn and play. I don't enjoy playing Candy Land. Because of the simplicity, it isn't really fun to play as an adult -- but that's fine since I'm playing for Kate, not myself. For me, the real annoying bit of Candy Land is a mechanic I omitted from the last paragraph: if you draw a card with a sweet treat on it (e.g. the candy hearts), you move to the treat. That's great if the treat is ahead of you, but often times you've passed it long ago. I don't want to think about how many hours of my life I've spent re-playing the same game of Candy Land because Kate and I each drew a card to send us back to a treat near the beginning of the board. At least it isn't Chutes and Ladders, right? The other issue I have with Candy Land is one of motivation. In our version, the characters are red, green, blue, and yellow gingerbread men. They're identical besides their color. They lack personality. The game has no sense of urgency beyond wanting to win. You don't really get invested in it. Kate plays Candy Land but she doesn't love it. It is just another thing for us to do together. She'd rather pretend. Like many children her age, Kate does love Paw Patrol. At her request, I spend many nights pretending to be one of "the pups" with her. 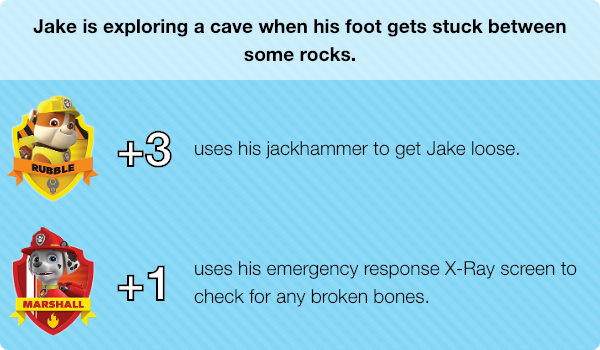 Paw Patrol is basically the opposite of Candy Land. The characters have well-defined personalities and abilities. There's a sense of urgency in each adventure. Kate is invested in an episode of Paw Patrol. Kate has a Paw Patrol Busy Book that includes 6 small pup figures. One day she decided we should use these figures instead of the gingerbread men to play Candy Land. I didn't realize at the time how much it would change the game. Now she wanted Rubble to beat Chase to the end. Along the way, she mentioned different previous adventures the characters had been on. It infused some much-needed personality and purpose. I decided to try to build a game that pulled all these things together. The objective is to reach the end first. It should be easy to construct from readily-available materials. Reward-only mechanics (no frustrating backtracking). Make use of the characters' personalities. I went to the store and purchased 22x14 inch sheets of paper and color-coding round stickers. I put down a winding path of alternating colors on a sheet of paper. That night Kate and I each rolled a six-sided die to move the pups to the end. It wasn't exactly fun yet, but it was already a game. 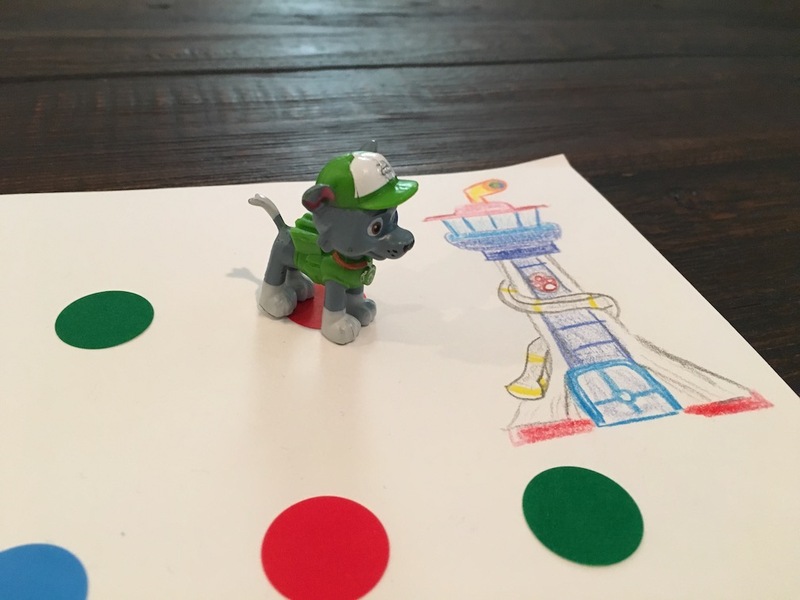 I promised Kate I would later draw the Paw Patrol headquarters (The Lookout) at the end of the path. She reminded me about this for several days before I finally sat down and drew a passable Lookout. The pups (it kills me to keep typing that, by the way) already have their own personalities, likes, dislikes, and abilities. Some of that would come across in the role-playing of the characters. I decided the reward mechanics should build on this and felt that a card-drawing approach was the best way to make this happen. You can demo the cards here. A card will only ever show two pups at most. If more than two pups could solve a problem, two are chosen at random. Kate loved the cards. She recognizes scenarios from the show and helped me write some new scenarios and suggested which pups could solve them. Kate enjoys playing the game. She is much more invested in it than other board games we play and liked helping me create the scenarios. This game has helped us extend her pretending into more structured role-playing in a game. We had fun getting here. Mission accomplished. With kids, the perception of fair is less important than actual fairness. The game itself isn't terribly fun. But we'll reach for it instead of Candy Land. Thinking about the future, it might be more fun for her if the card deck app only included cards for the pups that are in play. This would change the mechanic to always be a bonus rather than ever being neutral. It would probably feel more fair to Kate. A middle ground might be to change the random pup selection for multi-pup cards to favor the pups in play. Overall, this was a fun experiment and I wouldn't change too much besides adding more scenarios, laminating the board, and the aforementioned card tweaks. It was good quality time with my daughter, too much time reading the Paw Patrol Wiki, and I learned a little CSS along the way. Not bad. Maybe you should try something similar with your kid. I still love Elixir and reach for it when hobby time permits. Elixir's pipe operator |> is a boon for code readability. As time went on, I wanted it to be easier to type. Now any time Vim receives an F13 keypress, it creates a new line starting with |> and I can start typing the next part of the pipeline. Wait, F13? My keyboard stops at F12! How is this better than manually starting a new line and typing |>? Fortunately iTerm2 makes it easy to trigger F13 with a custom Key Mapping. 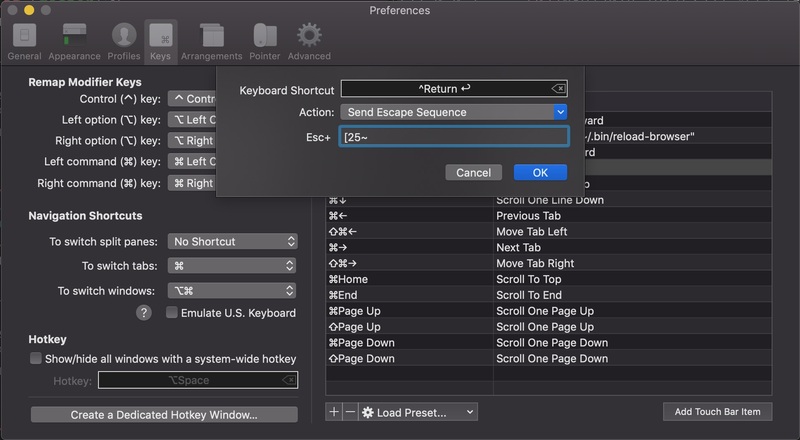 As you can see, I've mapped ctrl+return to send the escape sequence for F13 in iTerm2. Since I've rebound caps locks to control, ctrl+return is a very convenient combo to press. ctrl+\ is conveniently physically close to ctrl+return so I find the mental mapping as a similar (but slightly different) concept both memorable and pleasing. I'll admit this seems silly, but these sorts of optimizations for ergonomics keep things flowing. this can vary by terminal emulator). Do you have a better suggestion or use a similar approach for your preferred terminal emulator? Hit me up on twitter @semanticart. Are you using hub to create your Pull Requests? How are you handling embedding images? Wait... you are embedding images, aren't you? For my money, a screenshot is one of the most important parts of a PR body. The context provided by an image goes a long way towards understanding a proposed change. A picture is worth a thousand words and all that. Until recently, I'd been using hub to create a pull request, and then editing the PR on GitHub to embed screenshots. This always felt a little clunky and I assumed I'd make it more seamless some day. Cue the cheesy dramatic music: That day has arrived. Some instructions here will be Mac-specific but I'm sure you can figure out how to tweak it for your setup. For longevity, you should probably use one of your company's s3 buckets for work-related PRs. Assuming you did step 1 correctly and have a screenshot in your clipboard, how do we upload it somewhere world readable? We'll use two new commands (both available via homebrew). pngpaste is a great utility for pasting an image to a file. awscli has an s3 subcommand for uploading files to a bucket. And there ya go. No more editing the PR after the fact. If you use vim, you're now a quick :r !s3_image away from embedding a screenshot straight from the clipboard to your PR body. Make it a proper mapping. Declare victory.